Have you ever rescued or adopted a Siamese cat or kitten? 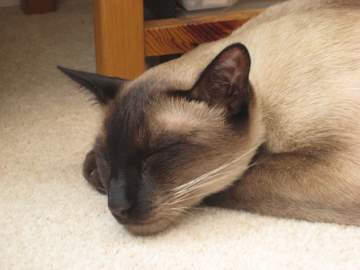 Why not share your Siamese cat adoption story with us? Build a page about your cat? You can do this by visiting the 'Your Photos and Stories' page (see the buttons on the left) but in the meantime, here's my own rescue story, which is followed by others from visitors to the site. I'd been thinking about Siamese cat adoption for a while, mainly because we'd been 'adopted' ourselves by a neighbor's Siamese, who visited us every day to nap in our living room for a few hours before trotting home again. 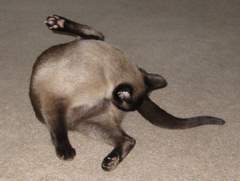 This rekindled my interest in Siamese cats, so I looked for a rescue and adoption center. I fell in love with a picture of a male seal point on their website. He just seemed to have my name on him! But I was about to go away on a business trip, so I promised myself that if he was still there when I got back I'd contact the adoption center straight away. Which he was, so I did. 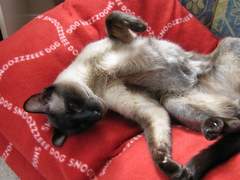 I learned that the cat (he didn't have a name, then) had been at the Siamese rescue center for about three months. He was a stray and although many efforts had been made to find someone to claim him, no-one had come forward and because he wasn't microchipped, there was no way of tracing his owners. The rescue center wanted to meet my husband as well as me, so one rainy day we drove over to be 'vetted', and, of course, to meet the cat. Once we'd decided to go ahead, an adoption volunteer was sent to inspect our home to make sure that it was safe and suitable for cats, and after we'd been checked out we got the news that we could go and collect him. I was a bit nervous about bringing him home! He seemed to be a pretty laid-back cat, but you can never tell how long a rescue cat is going to take to settle in. He kept up a constant miaowing from his carrier in the back of the car through the whole journey. This is not a cat who likes car journeys! I needn't have worried. Within minutes of being let out of his carrier, he made himself right at home, as you can see! Some rescue cats can be very nervous and hide themselves away, taking months to settle in. This was not one of those cats. He quickly learned to make himself understood – 'FOOD!' and 'TUMMY RUB!' are his favorite commands. It took a few days to find a name that suited him, but eventually we called him Bandit because he looks as if he's wearing a mask. He was a stray, so we don't know his age. The rescue center and our vet reckon that he was about four or five at the time of adoption. But however old he is, we hope he'll be sticking around for a good few years yet. Cat costs - can you afford to take on a cat? Praia Fluvial Siamese kitten find!